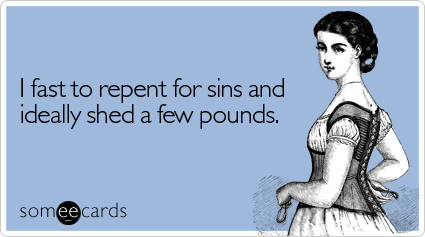 For those of my Jewish readers may you have an easy and meaningful fast. 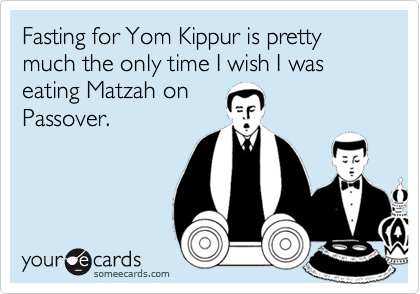 I couldn't help but provide some comic relief with some of my favorite ecards about Yom Kippur before repenting for all the naughty things I've done and eaten last year. For those of my non Jewish readers if you are curious about this sacred day we call Yom Kippur please check out this "fact" sheet. G'mar Chatima Tov - may you be sealed in the book of life. Asia de Cuba is one of my all time favorite restaurants. In fact I can still remember my first meal there when I was 18 years old. My mom took me to NY city for my birthday and we ate our way through some of the cities best and trendiest restaurants. Till this day my mom is one of the most serious foodies I know, I guess we now know where I get it from. Anyways Asia de Cuba is fabulous restaurant with locations in NY, London, San Francisco, Los Angeles and Miami. 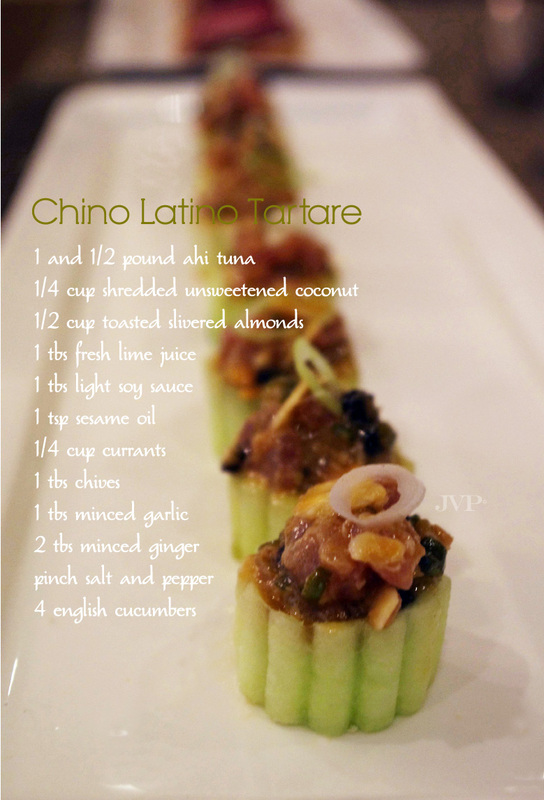 The food is tapas style with influences from Cuban & Asian cuisine. This tuna tartare is my take on their famous dish "Tunapica". To make to make the dish a little more heart healthy I serve it in cucumber cups instead of deep fried wantons. 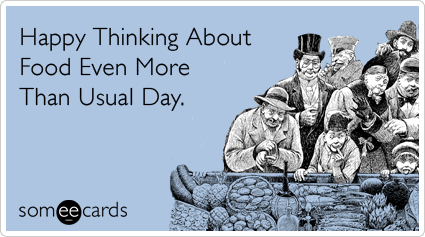 Either way the tartare is to die for! If you don't have time to make cucumber cups or fry your own wantons you can serve it up on potato or tarot chips as well. What's great about serving an appetizer like this is you can prep everything in advance then quickly toss it together right before serving. If you like spice you can add a drizzle of sambal or sriracha to the dressing. 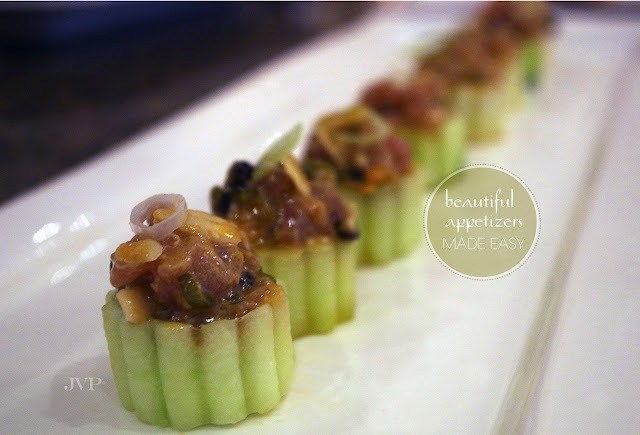 6 - toss tuna, dressing, & dry mixture together and spoon into cucumber bites. 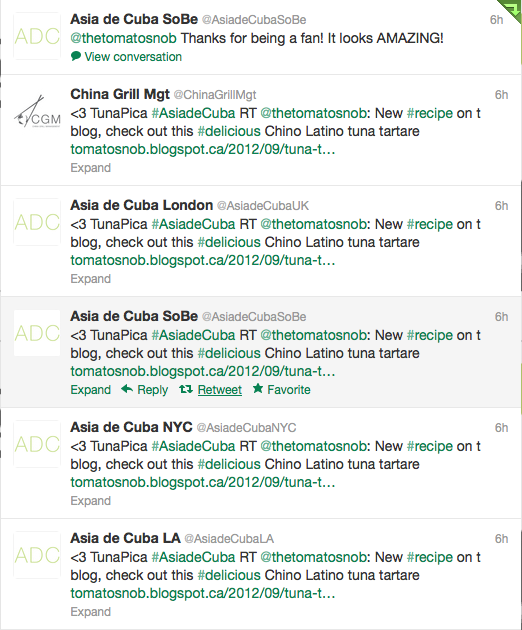 So grateful for the #twitterlove from the operators at Asia de Cuba, many thanks. Now when can a girl get a calamari salad in Toronto? I'm enjoying a beautiful fall afternoon with my mama & my totally adorable grandfather, eating drinking and enjoying our time together. Yes it's September. I don't know whether to cry or celebrate the fact that fall is here. It seems like the summer swept by in a blink. Like May was only last week and I was celebrating my 30th birthday with family and friends. I'm in a mood today I guess, a mood that can only be lifted with this delicious simple end of summer dinner. It's light and flavorful and will not dissapoint. A while back I had the pleasure of cooking for newlyweds Macy & Stephen. They were a couple cool kids that love their food and wine, needless to say we hit it off emmediatly. I promised them I would post the recipe for their dinner that evening and here it finally is. 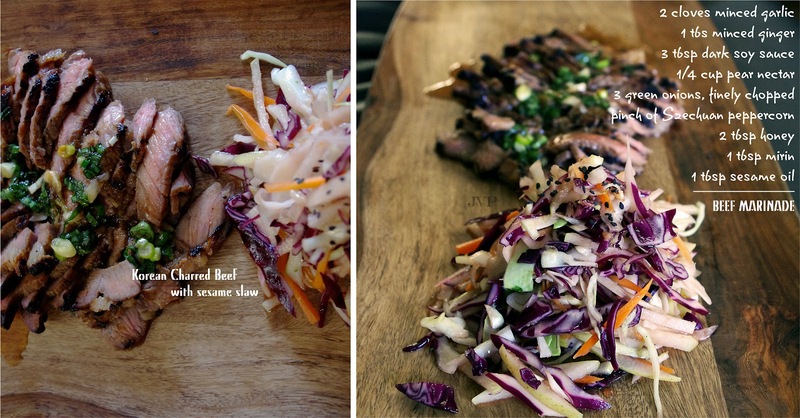 * Macy & Stephen - I actually made a variation or this slaw using a hoisen vinaigrette from the Vietnamese salad roll dipping sauce. It was basically just hoisen sauce, sambal chili, splash of citrus, splash or rice vinegar & sesame oil. I also added julienned peppers & cucumber to the mix. FOR THE BEEF: Season beef on each side with salt, then whisk marinade and pour 1/2 on the beef (we used NY strip). Allow marinade to sit for 1 hour if you have the time. 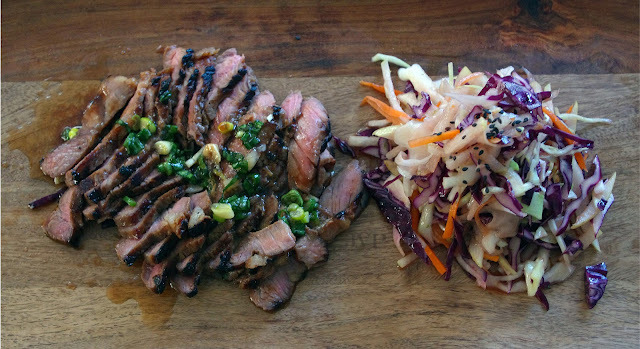 Reserve the rest of the marinade to spoon over the dish once it's finished. COOK: In a blazing hot cast iron pan sear beef for two to three mins on each side (for medium rare). Do not move the meat around in the pan, you want a crust to form around the edges to create the char. Touch the beef and if it feels slightly springy remove from heat and place on your cutting board. Allow beef to rest for at least 2 mins before you cut it into slices. *If you have a fan above your stove you will want to put it on before you begin to cook - this dish produces a lot of smoke. 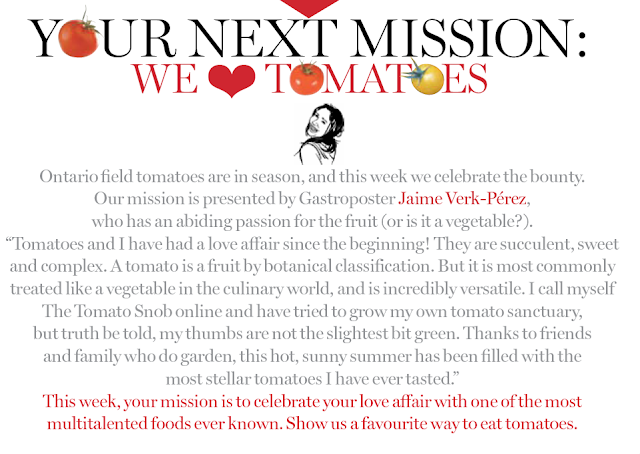 Do you love tomatoes as much as this Tomato Snob?